If you think you need to devote hours a day to exercise, you’re mistaken. 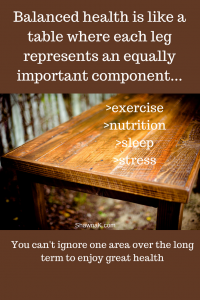 It’s your overall activity level over time that will make a big difference in your health. Studies even show that those that FIDGET tend to have a lower BMI (body mass index) than those who are more relaxed. I’m not suggesting fidgeting as an exercise plan, I’m just using this as an example that movement means increased health parameters. Suggestions for more movement include moderate things like walking, gardening, housework, recreational bike riding, easy hikes, playing with the kids – anything that gets you off the couch. NOW – it’s important to remember that this moderate movement is NOT ENOUGH for a total body transformation. If you’re looking to drop 20lbs or lose your menopause belly, JUST this movement won’t be enough. EXERCISE is actually only one quarter of the picture. Imagine a chair and each of these are a leg on the chair. It’s important to have a healthy balance in all four areas. If at some point you can’t exercise (due to injury, work commitments, company, holidays, etc), as long as you’re tending to the other areas, you’re going to stay fairly healthy. So, the big message is that over time, try to balance the four areas and one way to get your exercise in is with moderate movement EVERY DAY.